The word autism comes originally from ‘autos’, the Greek word for ‘self’ and means, literally, being absorbed in oneself. In 1943, the psychiatrist Leo Kanner adopted the term to describe some of his child patients: they appeared isolated from the world, withdrawn from social contact, and most had severe intellectual difficulties (Kanner, 1943). Kanner became convinced that these and other features of the children’s behavior reflected a syndrome, a specific disorder with a characteristic set of symptoms. Increasingly in recent years, the idea of an autism syndrome has been elaborated to allow for a spectrum – a range or constellation of disorders reflecting slightly different patterns of symptoms, and collectively known as autism spectrum disorders (or sometimes as autistic spectrum disorders). The terms ‘autism’ and ‘autism spectrum disorders’ (ASDs for short) are used interchangeably in much clinical work, as generic descriptions of this spectrum. The term classic autism is often used by practitioners to refer to the core or prototypical autism syndrome. Key symptoms in the three areas of the triad include the following. 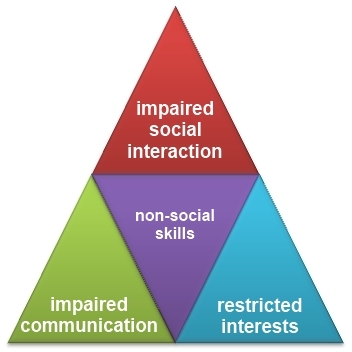 The central triangle of Figure 1 refers to so-called non-triad skills that may accompany the impairments. People with autism may be skilled in some non-social domains such as drawing, playing an instrument, math, and so on. Wing and Gould (1979) carried out an epidemiological study in which they screened 35,000 children under the age of 15 for the presence of one or more symptoms within the main autism triad. Of all these children, 17 (or just under five children in 10,000) matched accepted criteria for classic autism. However, a considerably larger group had some difficulties in reciprocal social interaction, usually coupled with communication problems and a restricted range/scope of activities. Including this wider group, the overall estimate of prevalence was more like 21 children in 10,000 (equivalent to 0.2 per cent). Wing and Gould’s conclusion – that the autism syndrome embraces a core set of symptoms and variations on this core pattern – established the spectrum concept. More recent studies have suggested even higher rates of incidence for the broad spectrum: between 0.6 and 1 per cent of all school-age children. A likely explanation is that diagnostic practices have changed since the Wing and Gould study to include more borderline cases. However, some researchers have recently argued that there is an increase in the actual incidence of autism spectrum disorders, claiming that it is diagnoses of classic cases that have increased. The evidence for this claim is currently unclear. A consistent finding is that males are more likely to be affected by ASDs than females: the ratio ranges from 4:1 for classic autism to as much as 10:1 for ‘milder’ conditions within the spectrum. It has so been noted that there is a similar male/female difference for dyslexia, and this is a typical feature of developmental disorders where communication is a central component. Autism spectrum disorders: Collective term for the group of closely related conditions all of which share some or many of the symptoms of classic autism. Sometimes known as autistic spectrum disorders. Classic autism: The most typical type of autism spectrum disorder, characterized by impairments in social interaction, verbal and non-verbal communication, and restricted scope of activities and interests. Epidemiological study: Large-scale study of the incidence and distribution of a disorder within a population. Symptoms: Characteristic manifestations of a psychological or medical condition that are observable to others and/or can be described by the person who experiences them. Syndrome: A psychological or medical condition characterized by a specific set of symptoms that regularly occur together forming a recognizable pattern. 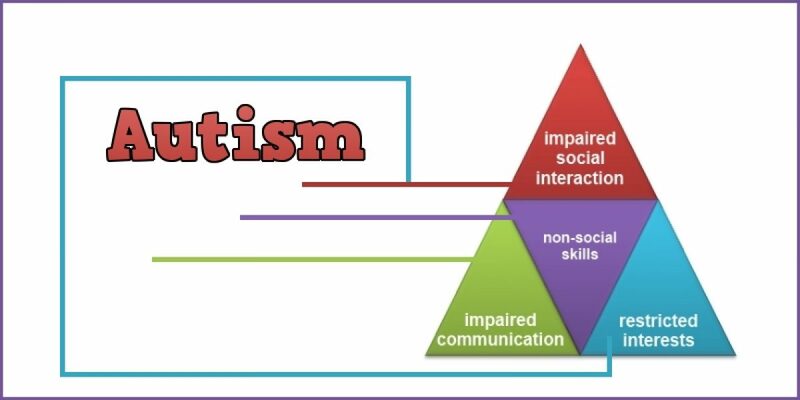 Triad: Characteristic three-way pattern of impairments in autism spectrum disorders. Kanner, L. (1943) ‘Autistic disturbances of affective contact’ Nervous Child 2, 217–250. Sainsbury, C. (2000) Martian in the Playground Bristol: Lucky Duck Publishing. Wing, L. and Gould, J. (1979) ‘Severe impairments of social interaction and associated abnormalities in children: epidemiology and classification’ Journal of Autism and Developmental Disorders 9, 11–29. This article is adapted from ‘The autistic spectrum: From theory to practice’. An OpenLearn (http://www.open.edu/openlearn/) chunk reworked by permission of The Open University copyright © 2016 – made available under the terms of the Creative Commons Licence v4.0 http://creativecommons.org/licenses/by-nc-sa/4.0/deed.en_GB. As such, it is also made available under the same licence agreement.